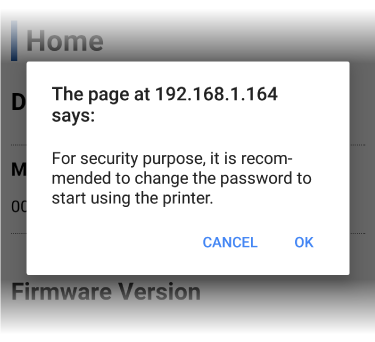 Connect the printer and a tablet or PC, and set a fixed IP address to the printer. 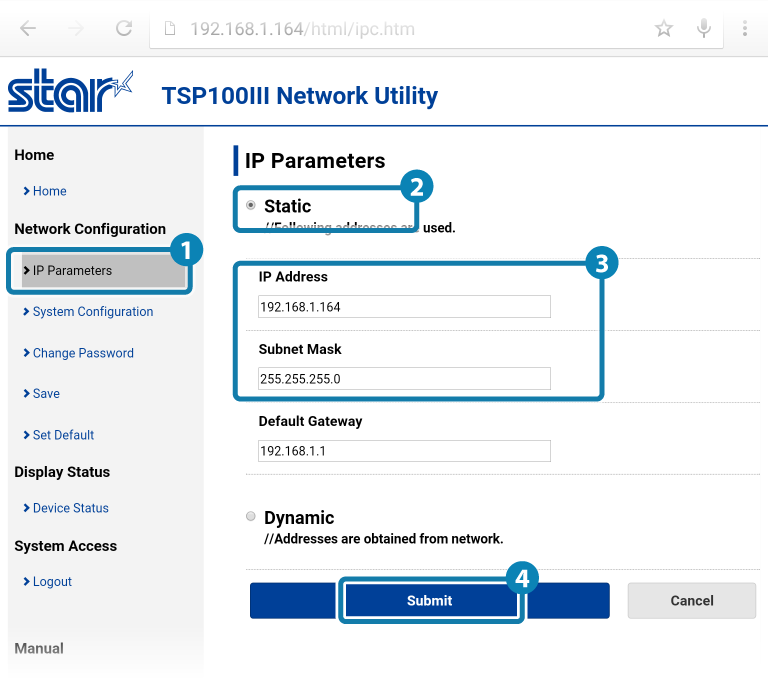 Once a static IP address is assigned, IP address changes through the DHCP server will not occur, so the specified connection destination device can be used continuously once set. The setting method depends on the OS of the device you are using. If you are using DHCP (If a fixed IP address is not set), then connect a LAN cable to simply complete the connection. By specifying the IP address output by self-printing, print settings can be configured. 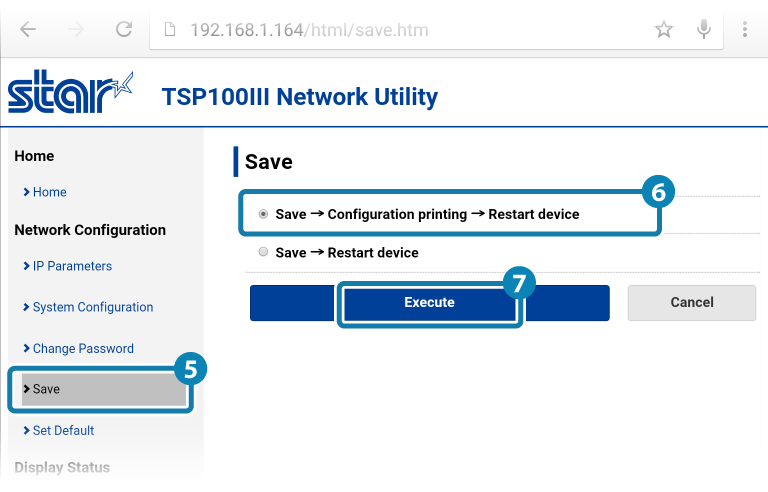 To use an iOS/Android device in an environment without a DHCP server, you must first set the IP address of TSP100IIILAN from a PC that is connected to the same segment (network) as TSP100IIILAN. Prepare the PC environment (Windows/Mac/Linux) and configure IP address settings according to the corresponding guideline. The following message is displayed when you are using the default password. Select [OK] to change the password or [Cancel] to not change the password. If [OK] is selected, a screen to change the password will open. After changing the password, return to the following step. For security purposes, it is recommended to change the password when using the printer. 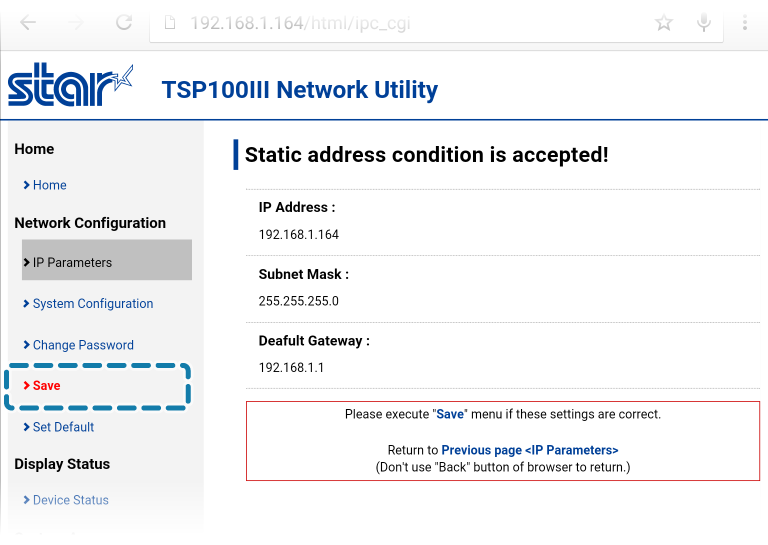 From the menu displayed on the left side of the setting screen or the menu button displayed on the upper left, open [IP Parameters] , select Static and enter the IP Address, Subnet Mask , and tap [Submit] . Ask your network administrator about the static IP address and subnet mask to use in the settings. A screen where you can check and save the entered details will appear. From the menu or the menu button on the upper left, open [Save] , select SaveConfiguration PrintingRestart device , and tap [Execute] . The settings are saved to the printer and printed out.